I couldn’t help but smile when I saw how her kitchen turned out. It looks so friendly. 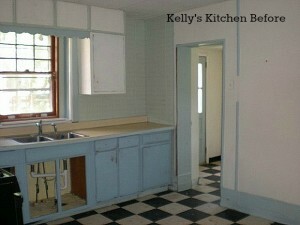 For more photos and information about Poppy’s kitchen, visit her blog. Thanks to everyone who submitted photos for my contest, and for keeping the comments about them positive and polite. I love seeing where you guys cook! I love this so much. It’s charming and homey. White kitchens can look so clinical but not with all the beautiful touches that pop with color. This was worth waiting for! What a charming kitchen! I love it. Nice work. Worth the wait. What a FUN kitchen!!! I would love to spend my days in a happy kitchen like this. Lots of color and all the collectables make it so friendly. Glad to see she bucked the depressing gray trend and went for something lively and real. That is absolutely charming! Love it! 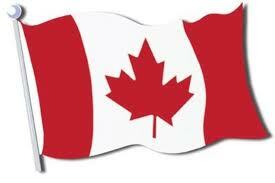 Hello from a fellow Canadian. What a sweet kitchen. Can smell the homebaked cookies & fresh coffee brewing. 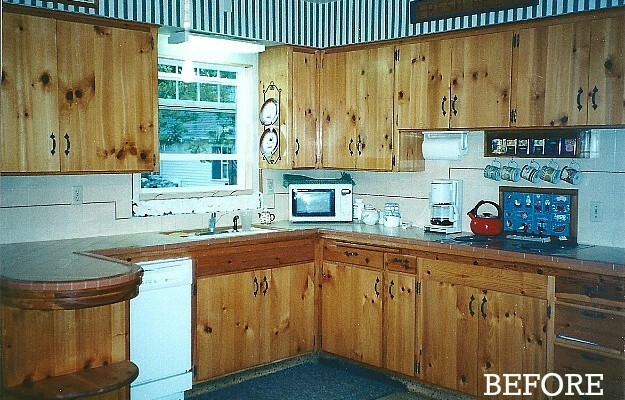 This is absolutely a kitchen anyone would feel right at home in. I’d feel so cheerful in that kitchen. Unpretentious, personal, and best of all it is welcoming! Charming is the perfect word for this kitchen. This is DARLING! I love it so! I love this kitchen! It’s the best of the makeovers! 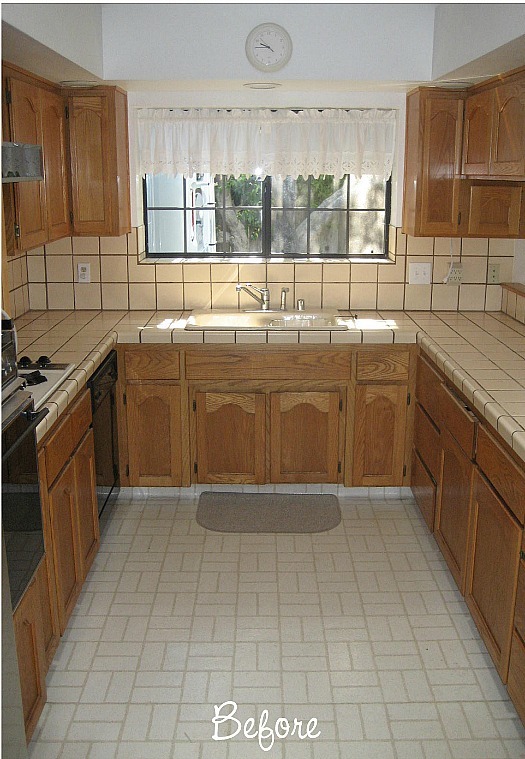 Now this is areal kitchen! Absolutely delightful! I could spend hours here in this beauitful, bright and cheery space. As a fellow Cannuck, I love the whimsy and splashes of colour! Well done, Poppy! I love Poppy’s white kitchen with the pop of RED! It’s cherry and cosy and just a delight. Cute as a button! Hi Julia! 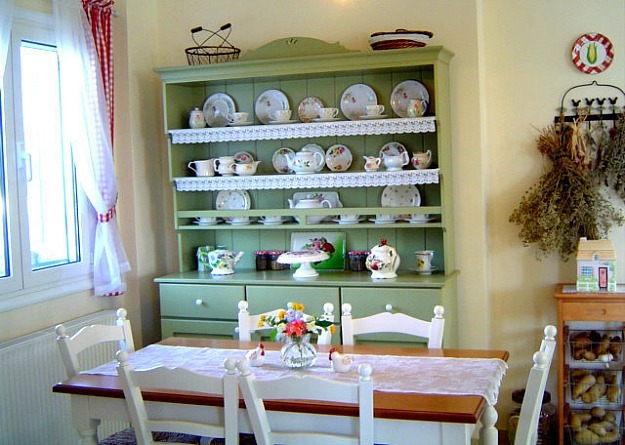 Oh, what a darling kitchen! I love looking at other people’s kitchen so much. I get ideas and envy quite a bit too. 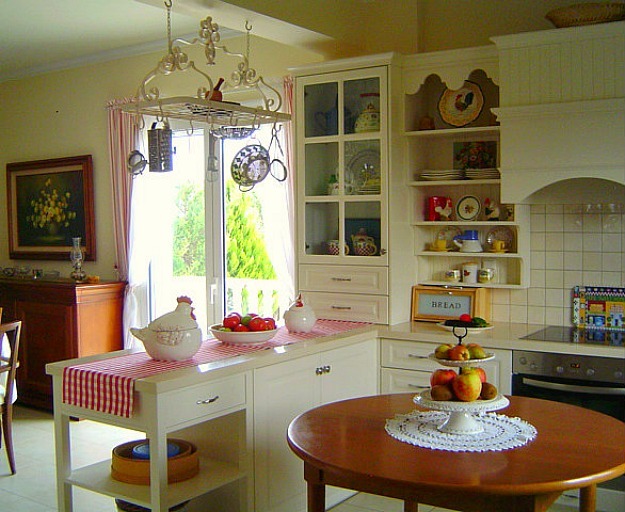 What a lovely and cheerful kitchen! I would feel happy cooking in there each day. Thanks so much for the feature! Just got back from a long weekend at my mum’s (no internet!) and was so excited to see your lovely presentation of my favourite room in the house, and the very kind comments! Thanks again for giving us ”contestants” the opportunity (read: reason!) to spruce things up in the most happening room of the house for your brilliant project! How beautiful! I’m loving the splashes of colour it ads to it’s charm. Hi Julia thank you for sharing this happy kitchen. Regards Esther from Sydney dreaming of Crete. Lovely! I really like the feeling of relaxation she gave to her kitchen, a place where the smells of breakfast in the morning welcome you. The accents of red and ceramic figures really set it off. Congrats! Really cute. I love the reverse tiered open shelves and the sorta scallop design over them. 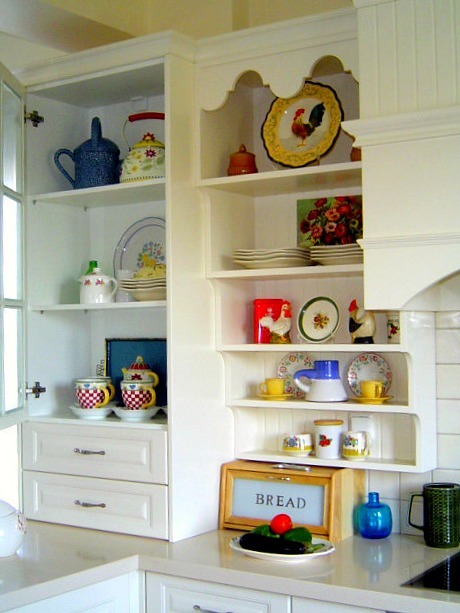 This sweet kitchen is like a little jewel box. You can’ t help but smile when you look at it. Poppy, are you telling us the contest got you going? What I love so much are your details. The shelves are wonderful. You are a great example of doing what one loves. Normally I am not a fan of a peninsula …but yours belongs there and now I want one. Heading to your blog to be inspired some more. What a wonderful, happy and bright after. Love it!! A beautiful kitchen with a beautiful story. I love that pot rack. 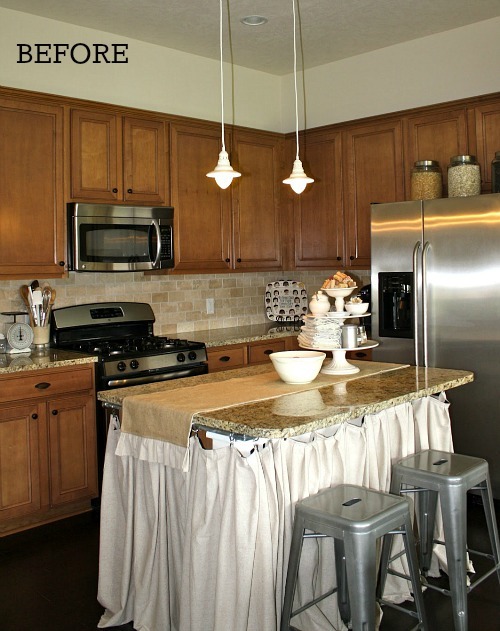 I love the whole kitchen It’s so adorable.Love that clock coming out from the top of the ceiling. 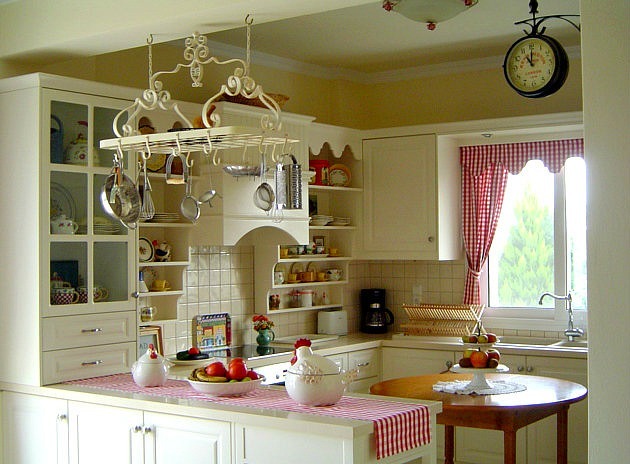 Love, love, love this charming kitchen. 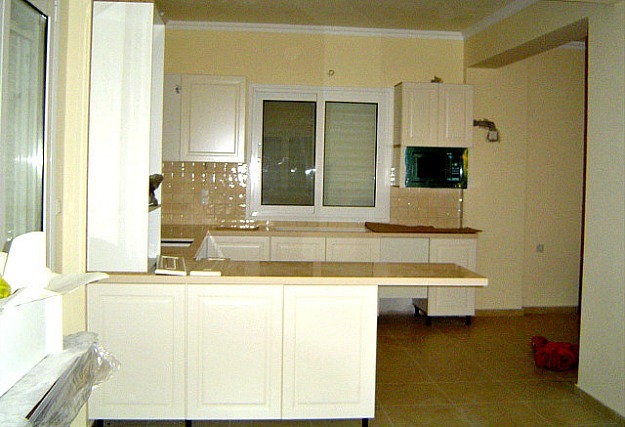 This kitchen just gives you a warm hug! 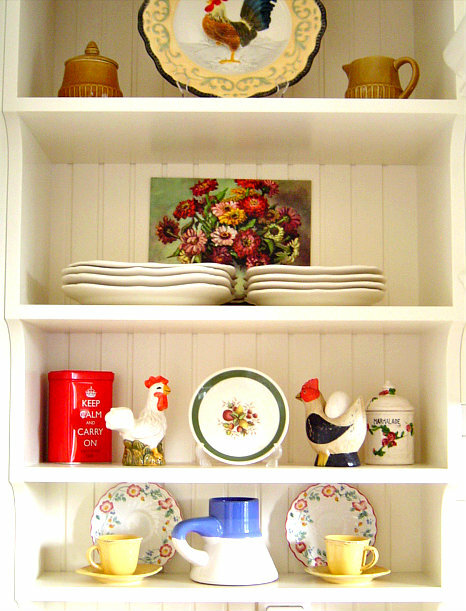 I LOVE the touches of red, mixed with the creamy whites and warm yellows. It’s perfect! 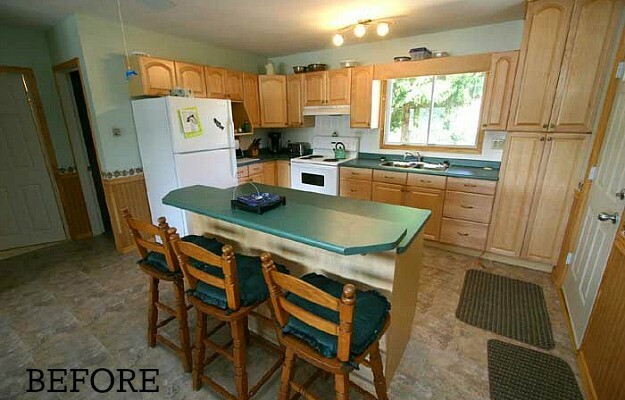 Love the kitchen and its colors but that round wood table is just sitting there in the middle of it. Seems completely in the way and can’t imagine trying to fit chairs around it with the limited space. Take it away and there’s so much more room to move around in the kitchen. 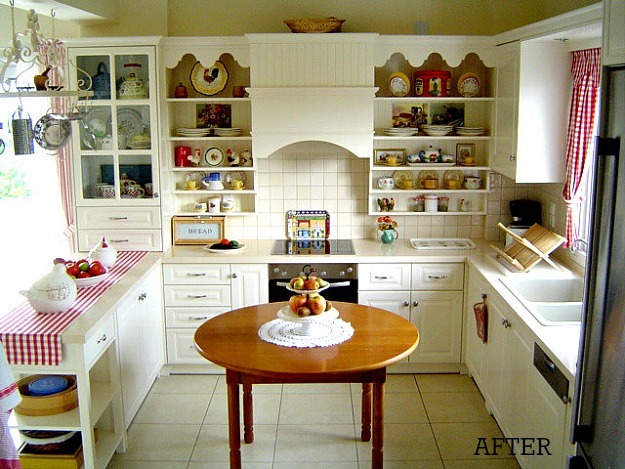 Kitchens aren’t generally a room that makes me smile – but Poppy’s kitchen did just that! 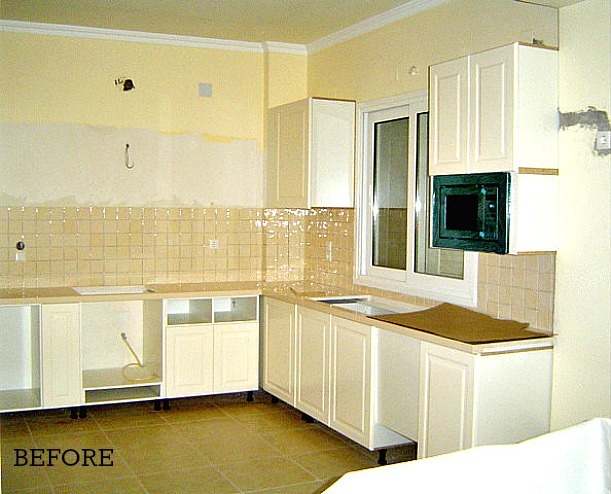 What a wonderful makeover. Cheerful, functional, and oh-so-homey. It’s lovely. Very warm and cozy. I love how all the colors just pop. Nice job! I vote for Chris’s Kitchen!! I love everything about it! !